Data released Wednesday by the U.S. Bureau of Labor Statistics showed Minnesota nudged ahead of Wisconsin by 3,096 total jobs. That's hardly a huge edge given the size of their overall workforces, which total almost 2.9 million workers in each state. 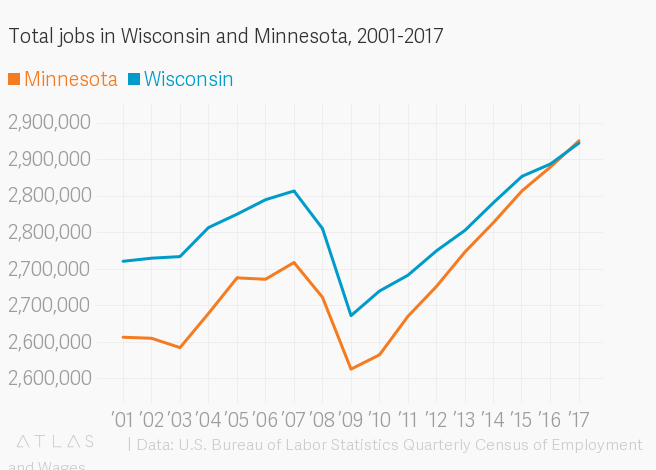 But the latest figures from the U.S. Census Bureau show Wisconsin still has almost 219,000 more residents than Minnesota, and just a decade ago, it had nearly 98,000 more jobs. Wednesday's numbers come from the Quarterly Census of Employment and Wages, which economists regard as the "gold standard" of job metrics. More detailed numbers that break down public versus private sector jobs won't be available for another couple weeks. University of Michigan Labor Economist Donald Grimes said what stuck out to him was that Minnesota had added more jobs than Wisconsin every year since 2010. "The fact that it's every year is somewhat remarkable," Grimes said. The numbers show that in 2017, Wisconsin added a total of 28,696 jobs. That translated to a growth rate of about 1 percent, which ranked 27th in the nation. Minnesota, by contrast, added 35,925 jobs in 2017 for a growth rate of 1.3 percent, which ranked 18th. From 2011 through 2017, Wisconsin added a total of 202,554 jobs, which ranked 34th in the nation. Minnesota added 292,976, which ranked 19th. The overall numbers come at a time when another job metric — the unemployment rate — dropped to 2.8 percent in Wisconsin according to preliminary figures. That's a record low. "To get an unemployment rate that low is great," Grimes said. "But that means that you're not going to be able to increase employment any more by reducing that much further." Minnesota's preliminary unemployment rate for April was 3.2 percent. Both states are lower than the national rate of 3.9 percent. But other figures give more of a clue as to why Minnesota passed Wisconsin. Minnesota's labor force participation rate — the percentage of the overall population that is part of the workforce — is 70.5 percent, which is slightly higher than Wisconsin's 68.9 percent. In addition, job growth in Minnesota's largest city far surpassed job growth in Wisconsin's. Hennepin County, Minnesota, home to Minneapolis-St. Paul, added 110,520 jobs from 2011 through 2017. By contrast, Milwaukee County, Wisconsin added just 17,680 over that same period. "You need to focus on why Milwaukee is doing so much worse than Minneapolis-St. Paul and how you can be more like Minneapolis-St. Paul," Grimes said. Full QCEW data covering all of 2017 will be released in June. That will show how Wisconsin's private sector economy compared to other states, and break down specific sectors, like manufacturing. WisContext associate editor Scott Gordon contributed data visualization for this story.